Will Avelar, a New Orleans Native and Sous Chef at Emeril’s Delmonico, spent his childhood in Costa Rica, where he was exposed to and inspired by a variety of unique, tropical flavors early on. It wasn’t long before Avelar knew he wanted to become a chef, so when he returned to New Orleans for high school, he took a job as a busboy at a local Italian restaurant. He then went on to pursue a degree in Culinary Arts. 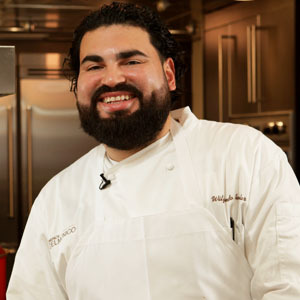 Avelar joined the Lagasse family in 2005, working his way from line cook to butcher and then to saucier at Delmonicos and then to Sous Chef at NOLA. He truly loves what he does, and it shows. Back at Delmonicos, he is contributing to the restaurants’ near-perfect reviews; on Open Table, the team has racked up an impressive 4.6 star rating out of 5. This compound butter is inspired by the classic French bordelaise sauce and includes diverse flavors like red wine, shallots, and bone marrow. This technique will show you the proper way to age, trim, and portion beef, all of which will contribute to an intensified meat flavor. This dish is rich, hearty, and bursting with New Orleans personality.